be careful not to drop any parts into the crankcase. Remove the oil pan, oil pressure regulator and oil strainer. Refer to “oil pan / oil pressure regulator / oil strainer removal and installation” . 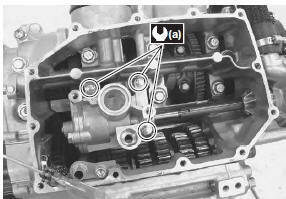 Remove the oil pump driven gear bolt (1). 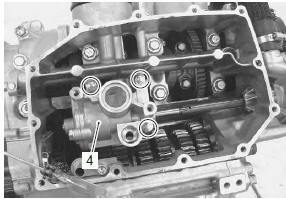 Remove the oil pump driven sprocket (2). Remove the oil pump (4). Remove the o-ring (5) and dowel pins. Apply grease to new o-ring. engage the oil pump shaft end with the water pump shaft slot. 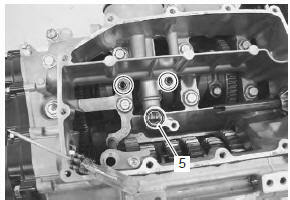 Tighten the oil pump mounting bolts to the specified torque. 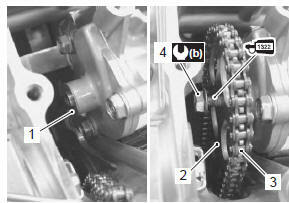 Install the oil pump driven sprocket (2) with the chain (3). 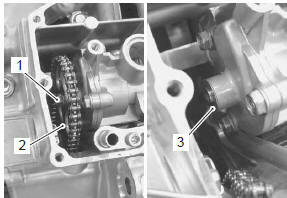 Apply a small quantity of thread lock to the oil pump driven sprocket bolt (4) and tighten it to the specified torque. Install the oil pan, oil strainer and oil pressure regulator. Refer to “oil pan / oil pressure regulator / oil strainer removal and installation” .